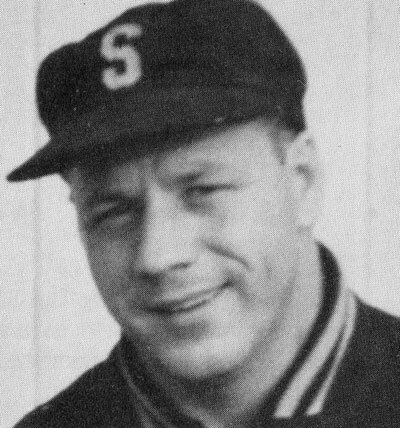 Ralph Harrison Stephen Baughman died August 12, 1983, but before he passed on he wrote some sensational chapters in Wayne County sports history. He was raised in the Smithville area, a fact which seems to dominate this year’s crop of inductees. Jane Buch and Lou Markle are the others. Steve was the sixth man on a basketball team which long-time Smithie coach Wilber Berkey rated as his best ever. The emphasis has to be on the word “team,” for not one of his players was selected to the County first or second All-Star teams. Berkey, who was also renowned for his fine baseball teams, used Baughman at shortstop where he displayed an outstanding arm. He also hit well enough to be offered a contract by the Chicago Cubs. He passed it up to remain on the local scene, playing basketball in the Wayne County Sports League and playing a little softball. Realizing he needed some further education, he enrolled at Case where he earned an engineering degree. He also worked for the Cleveland Graphite Bronze Company and played for their team in the fast Cleveland leagues. When Graphite decided to establish a plant at Napoleon, Baughman went along. It was there that he encountered Lefty Dexter; one of softball’s pitching greats. Dexter taught him how to capitalize on his speed, develop a change of pace, and curve the ball both ways. Above all, he imparted the secret of a vicious drop, which Steve could roll off the table, breaking it at least eight inches. When he returned to Wayne County in 1956, only the name was the same. No one could touch him. Pitching for a team composed of his old Smithville buddies; Steve broke in with a no-hitter, and then posted five straight shutouts. His record for the year was 21-2, with both losses being of the 1-0 variety. He averaged 17 whiffs a game, versus only one walk. Perhaps the most noteworthy game of his career came on August 12, 1958, when he hooked up with Chuck Hatfield in an epic 32-inning duel at Kurtz Field in Canton. Both pitchers went all the way with Steve losing, 1-0, on an error. He struck out 46 and walked only one man in a contest which still rates as softballs longest game. Steve left behind his wife, Ellen, and two daughters, Tammy and Jennifer Ann, plus a host of followers who still shake their heads at his phenomenal feats.